This post was written by guest blogger, Larry Chandler. Larry is an outdoor writer who often writes for Victory Outdoor Sports. When he’s not working on the latest freelance project he is usually out with his family, making memories. When you love fishing, there is nothing like that hook set to get your blood pumping. However, sometimes the search for a spot where fish are holding can be tedious and even time consuming. Thanks to the increasing knowledge about a center pin reel more professionals and weekend anglers are learning to use this nifty tool to find more fish. This type of reel is rather large compared to more traditional fly reels. The diameter of a center pin reel is typically about 4 ½ inches. At a distance the reel looks gigantic. The spool is actually set off slightly to the side. The sides are open which allows the line to flow off the reel freely in much the same manner as a spinning reel. There is no bail or drag, making the entire reel operate smoothly. Anglers that enjoy floating a lure in to the magical honey spot will really enjoy this kind of reel. A bait such as a night crawler or egg sack can be suspended under the float and target the strike zone. Using either split shot or a swivel you can monitor how deep or shallow the bait will run. The free flow of the line off of the reel makes this a perfect way to cover lots of water while floating a lure. There is no worry with line mending or monitoring the bail to make sure the line is moving along. The natural drift makes the bait more realistic to unsuspecting fish. 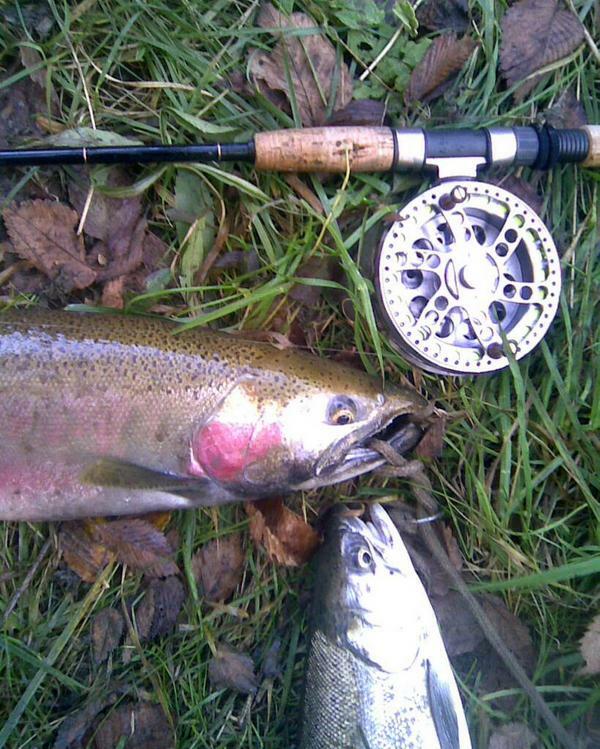 Some estimates show that up to 90% of professional guides on rivers are actually using a center pin reel to consistently land quality steelhead and salmon. The normally skittish nature of these fish makes a float lure presentation a good way of locating these feisty critters. The rise in popularity of the reel in the past few years has made it easier to buy from a wider range of shops. If you are new to the center pin type of fishing reel you need to be aware of the learning curve for casting. While a normal fly fishing movement would include keeping your hand on the front of the reel in order to let out the line when casting, the center pin reel will require that you hold your hand out by the side. This will take some practice in order to get comfortable with the different movement. A fluorocarbon leader using 6 lb. line will give you a good chance of landing a nice trophy without risk of breaking the line. 25 lb. test is most common for the backing and anglers will use about 100 yards. Another 200 yards of monofilament 8 lb. test rounds out the line needs. Leaders will normally be two feet or less. This is not to say that a center pin reel is the absolute end-all for fly fishing fans. However, if you can learn the cast, this could be a new tool in your toolbox that helps you land a monster steelhead. I liked this centerpin overview... I hear about them all the time but hadn't ever taken the time to ask the basics. Thanks for the info! I keep hearing about Centerpin setups but never looked into them. Guys that use them crush fish from what I hear. Thanks for the overview.